There’s a saying in fashion, “One day you’re in and the next day you’re out.” Now, I’m not telling you this because of my recent obsession with the show Project Runway, but rather to show the similarities between fashion and marketing. Like fashion, marketing has trends that are constantly changing. 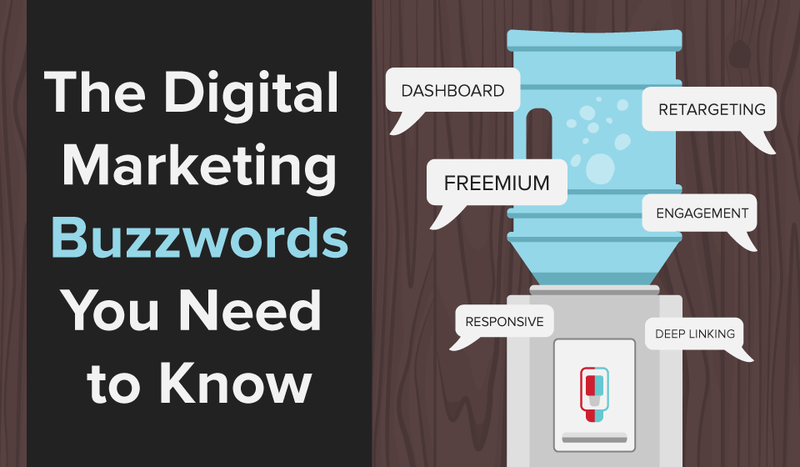 Each year a new set of “buzzwords” is incorporated into the marketing lingo and we are expected to pick them up with ease and push aside the words of the past. To help you in that endeavor, I have put together a list of the top nine buzzwords you should know in order to sound like the smartest marketer in the room! 1. Freemiums – just like the name sounds, Freemiums are pricing models that offer a free limited version or a premium account with added features at a discounted price for a limited time. Freemiums have proven to be a very effective way for business owners to attract new clients for their products or services.Who hasn’t been hooked by the “Free 30 days of HBO Now?” Just me, oh okay. 2. Mobile Optimization – the importance of this keyword cannot be stressed enough, your consumers have their phones by their sides 24/7. Mobile optimization means that your websites and products have mobile options and will adapt to whatever device on which your consumer is searching for you. This includes your overall website design, structure and page load times to make sure you’re not turning your mobile audience away from doing business with you. 3. Responsive Web Design – this is very similar to our mobile optimization buzzword above, but I have it in here again because the importance is invaluable. Your website design must be compatible with any device a person could use to find you – your business could depend on it. 4. Native Advertising – this is another way of saying sponsored content, but instead of a generic ad being randomly placed on websites, Native Advertising is both highly targeted and design specific. These type of ads look like they naturally fit within the design and context of website the ad is being displayed on. As a result, these types of ads have shown to increase visitor engagement over standard display ads. 5. Retargeting – have you ever noticed that you go to a website and the next day you see the website’s advertisements following you around? This isn’t a coincidence, this is retargeting! As creepy as it may seem, retargeting works to keep a brand’s message in your head! 6. Dashboard – a dashboard is a place where a business’ most relevant data is displayed in an easy-to-understand way. Have you seen of RevLocal’s most recent dashboard? Click here to see how we changed digital marketing! 7. Deep Linking – this is a great buzzword to throw around if you really want to sound like you know your marketing! Deep Linking means that if someone clicks on a link it will take them to a deeper page than the homepage of a website. This is great for different niches in industries, it will help save your customers the trouble of scrolling through your website if you take them right where they need to be. Check out our blog post, Get More Reviews With Mobile Deep Linking, to learn more. 8. Engagement Marketing – just like it sounds, Engagement Marketing describes the act of getting consumers to interact with a brand or its advertising. Businesses that are successful at this will take a more holistic approach to their marketing. They will spend their resources to consistently promote their brand and culture through social media and email marketing campaigns. This results in a much higher level of consumer loyalty from their fans and followers. 9. Snackable Content – this simply means that you should relate all of your marketing concepts to some sort of food. Just kidding! Studies have shown that visual decisions are made in three seconds or less – share your brand message concisely – give your customers a snack. There you have it, the top nine most important marketing buzzwords for this year (or at least in my opinion). Next time you’re around the water cooler with your co-workers, try dazzling them with some of these words — you’ll definitely impress.